While Twitter, Google+, Facebook and just about any social network you can think of has become home to more debates than we could possibly imagine, a new niche social network wants to get in on the online debating action. 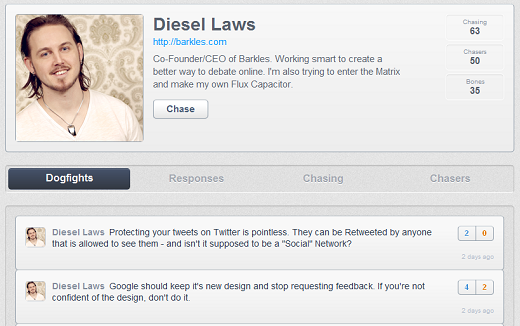 Barkles is a social network all about opinion and debates, and was co-founded by Australia-based Diesel Laws and Jay Whiting. 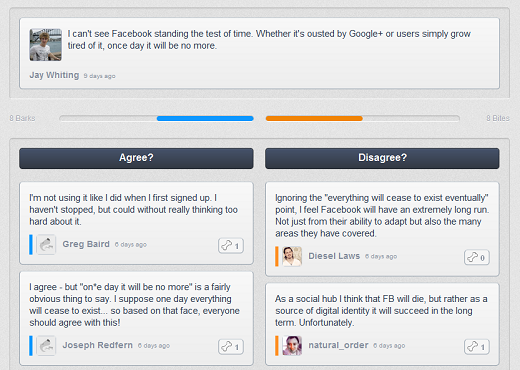 After signing up for an account, you can start a debate or ‘dogfight’ by posting a thought or idea. Alternatively you can dive right into some of the existing debates by agreeing or disagreeing with the post, and explaining your point of view. The two different sides of the debate will appear side by side below the original post. Existing topics are listed under the Popular and Active tabs to see what topics other people are discussing. Barkles has one seemingly Twitter inspired featured – and that is that you have only up to 200 characters to get your point across – whether you’re starting a new topic or replying to an existing one. User profiles display your friends and followers, and how many bones you’ve received. Bones are the equivalent of +1’s on Google+, but are given only on comments. If someone agrees with a comment you made on a debate, they can give you a bone. Literally. The number of bones you’ve received will be displayed on your profile, along with showing who you follow (or chase in Barkles lingo) and who follows (or chases) you. Your profile will also display all of your Barkles activity – with a tab featuring dogfights you’ve started, and a tab featuring responses you’ve made. There are all sorts of varied debates taking place on Barkles, about religion, coffee, social networks, browsers, and even debates about Barkles itself. The site can be used as a way of discussing interesting topics, conducting polls and can even be an interesting tool for getting feedback on your work. A particularly interesting meta-debate taking place about Barkles argues that the site is a solution looking for a problem. While the majority of responses disagree with the statement (as would be expected seeing as there is a small but active community on Barkles), one user suggests that Barkles’ longevity is not in its current state, but rather being incorporated into other sites, much like existing services such as Livefyre and Disqus. We could have done without the cutesy references to bones, barks and bites, and all sorts of dog-related phrases, but the basic idea of the site definitely has its merit. What do you think? Does Barkles stand a chance? Let us know in the comments.